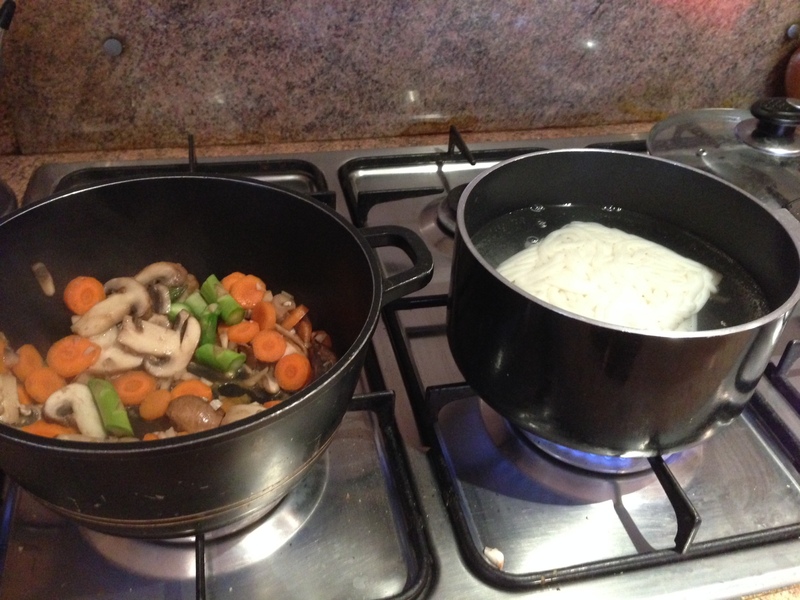 FYI: Work with two pans – it’s faster and easier to serve the noodles then pour the soup mixture on top! Put about 1 tbsp of sesame oil and stir fry mushrooms. After a few minutes add carrot then asparagus. Add a bit of water and cook. Add water and miso paste. Keep stirring till fully dissolved, Add soup stock and all seasoning. Add the tofu. Serve on top of noodles! Note: Kitsune Udon is usually prepared with fried tofu which is available in Asian Shops. It has a spongy texture and absorbs flavour very well. However the fat sitting on my stomach right now is not allowing me to eat that kind of tofu. SO THERE YOU HAVE IT. Low fat. 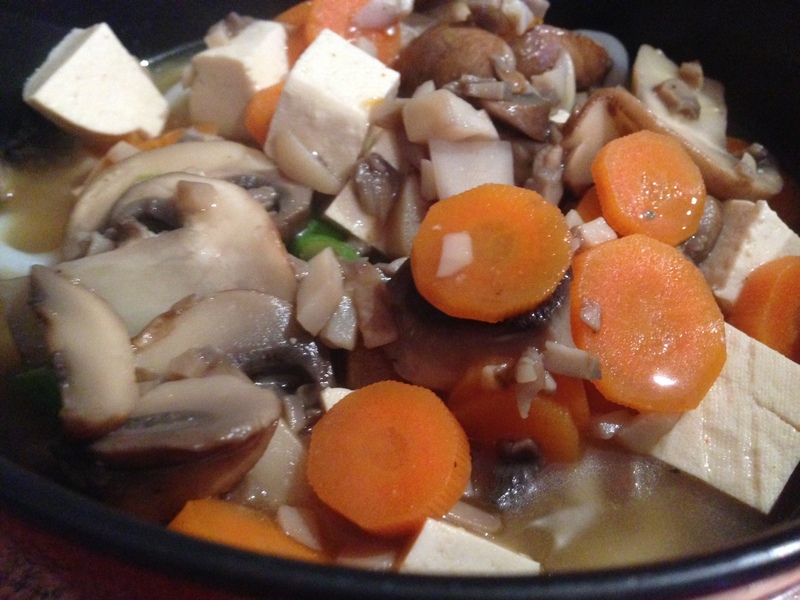 You can change the veggies to your liking – I just used up what I had in my pantry! Hope everyone has a fantastic weekend! I’m going for some retail therapy this weekend. It’s been a hectic week -that’s why I’ve barely posted! I felt guilty using everything that was basically ready-made so I made the red sauce. I like pasta extra saucy so I make sauce in abundance! Makes enough for 2 starving souls. Put oil in pan and cut finely chopped onions. After onions are translucent and a little brown add tomatoes and cook. If its drying up add some water and keep cooking. Add the can of plum tomatoes and the concentrated tomato puree. Simmer for half an hour or longer. Add all the seasoning and some water (see your preferred consistency. I don’t like my sauce to be too runny!) Add sugar according to sourness of the tomatoes. If you simmer it longer it will be less sour and less sugar will be required to combat it. 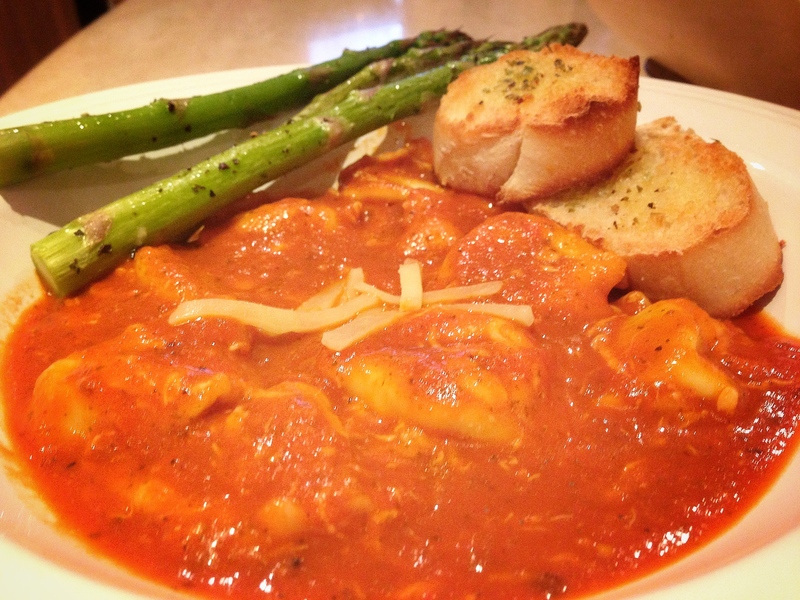 Note: I serve it with herb baguette and roasted asparagus to just make the meal a bit more complete! Bon appetite! Hello all… It’s Foodie Friday again! Yipppeee. Thought I’d blog about something easy, fatty and British. JACKET POTATOES. Simple to make and yummilicious (It’s a word I swear- well it is one in Sparkle Bubble hahaha!). Here’s an easy recipe! Hmmm.. Doesn’t that just look delish? Ok and sort of like a heart-attack on a plate, but we can ignore the fat part. Whenever I indulge in Jacket Potatoes it becomes my brunch. I think that honestly compensates for how heavy it is. Spreading it across two meals makes it justifiable. Yes, I love making myself feel better. Hahahaha! Cut a cross in the middle of the potato. Poke all sides with a fork for even baking. Bake for 1 hour 20 mins. In the meantime, put beans in a pot and add salt, pepper and any desired seasoning. After the potato has baked, open the potato up gently and butter the inside. 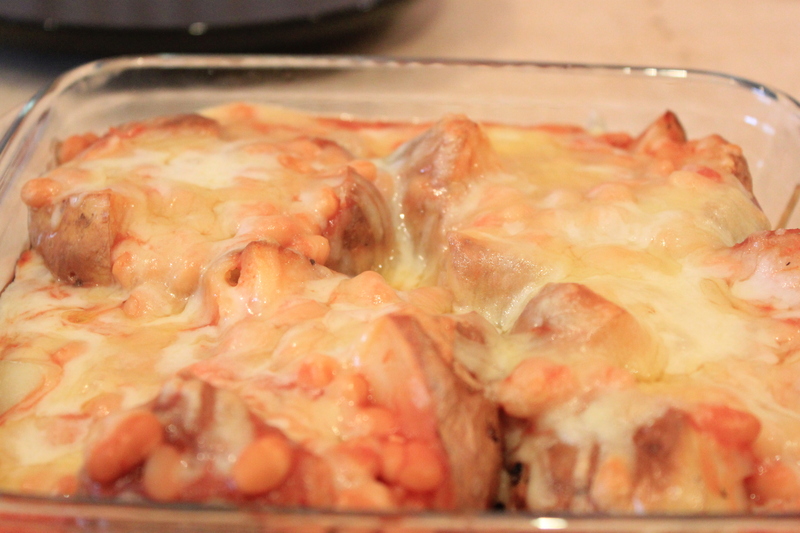 Pour baked beans generously and top up with cheese. Return dish to oven till cheese is bubbly! Note: You can serve this with coleslaw as it goes very well. I’ve also made Jacket Potatoes with different toppings such as: Veg Tuna and Quorn Minced Meat. 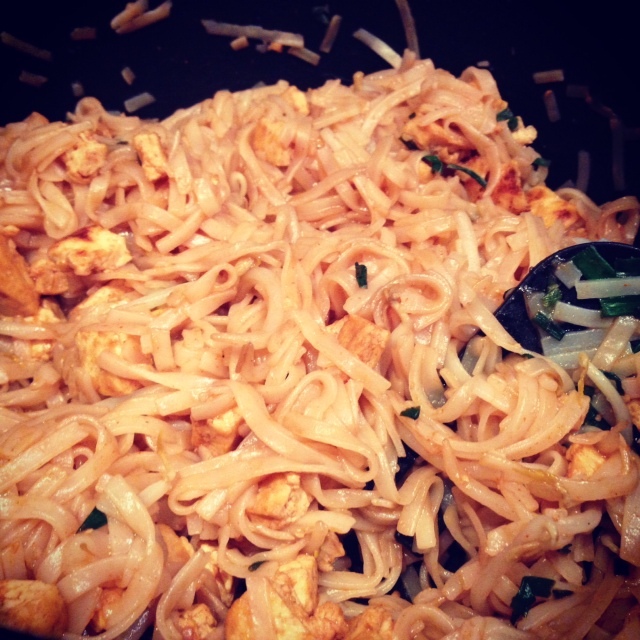 In the midst of packing – I made a scrumptious Thai meal (Vegetarian Pad Thai). Easy to whip up for busy days. Thought I’d share it before going since my flight is pretty late at night anyways. I made extra so my husband can have it for lunch tomorrow. I’m nice like that. 🙂 So- voila! Soak rice stick noodles in hot water for about 10-15 minutes until they are soft. Rise off. Pan-fry the tofu in big squares. Cut them up into little pieces after and keep aside. Put some oil in the pan, throw in all the ingredients except for peanuts. Stir fry everything together and add the seasoning. Guidelines of my seasoning to my taste (lol): About 1 tsp red chilli, you can cut some red chilli on the side too. Around 2 tsp of light soya sauce and a bit more of dark to give it a nice color. Keep trying as you go along as there are different brands which have a distinct flavour. I put about 3 tbsp of brown sugar (quite a lot!) And I just put a tiny bit of salt (since soya sauce is salty). I put about 2-3 tsp of lemon juice. Lastly, add peanuts and garnish with cut red chili. Enjoy! **Basically my tip with seasoning would be to keep trying as you go along till you are happy with the taste. I personally do not take too much spice. It’s meant to have a sweet-salty-spicy flavour!